S. Thomas’ College won the Mustangs Trophy for the fifth consecutive year when they thrashed Royal College by 131 runs in their 43rdannual limited-overs cricket encounter on Saturday at SSC Grounds, Colombo. After battling hard to post 216 for 9 on the board, S. Thomas’ off-spinner Kishan Munasinghe’s five-wicket haul was instrumental in bundling out Royal College for just 85 runs. 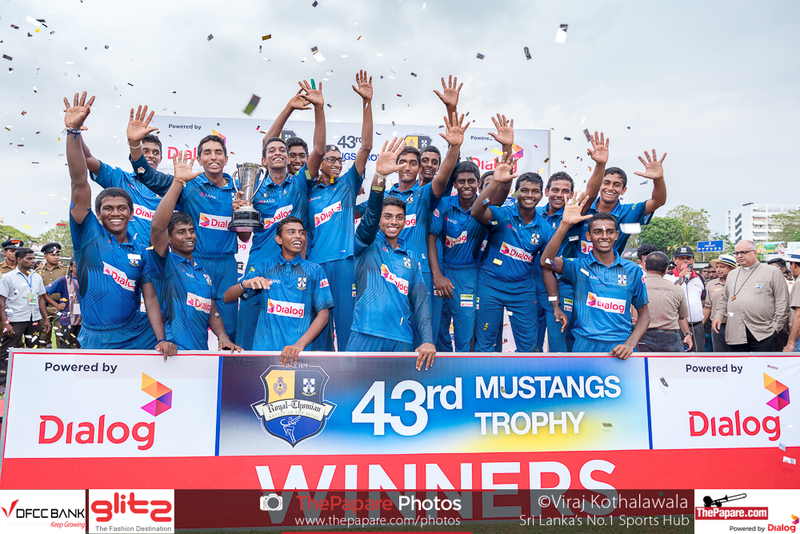 Photos: Royal College vs S. Thomas’ College | 43rd Mustangs Trophy. The lads from Mount Lavinia won the toss and elected to bat first on a fresh SSC surface. The Thomians unchanged from last week’s 139th Battle of the Blues got off to a steady start as their left-handed opening duo, Dulith Gunarathne and Shalin De Mel negated the first 10 overs adding 31 runs. They were going strong up until Royal’s best bowler, Manula Perera struck in the 17th over with the score on 59 when De Mel holed out to extra cover. 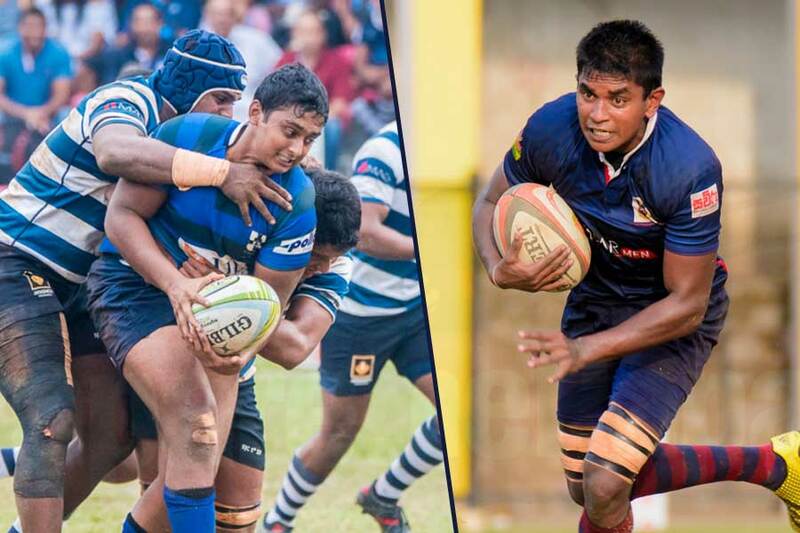 The first of many run-outs in the game brought the downfall of Gunarathne in the very next over as the Thomian vice-captain made a slow 69-ball 30. Royal left-arm spinner Yuvin Herath who was brought in place of Themal Bandara for this match proved to be the menace for S. Thomas’ as he dismissed Sithara Hapuhinna and Manthila Wijerathne in a short span of time to restrict the Thomians to 84 for 4 at the half-way stage. The Royal spinners were economical and bowled to a plan to limit the run-flow and take wickets at regular intervals. Kishan Munasinghe and Maneesha Rupasinghe made 20 and 21 respectively in the middle overs but the Thomians were in a spot of bother with 12 overs left as they were 141 for 7. A crucial 70-run stand between Kalana Perera and Thevin Eriyagama rescued S. Thomas’ College as they ended on 216 for 9 from their allotted 50 overs. Perera top-scored with a fine 37 which included 2 sixes and 2 fours while Eriyagama made 36 with 4 boundaries, both batsmen succumbed courtesy run-outs in the final over. Royal College started off slowly before Ahan Wickramasinghe was bowled down the leg-side by Shannon Fernando in the 8th over with the score on 20. Royalhad not added to their score when off-spinner Kishan Munasinghe squared up Gayan Dissanayake in the very next over with a perfect delivery which beat the outside edge and disturbed the stumps. Kamil Mishara chopped one onto the stumps off Munasinghe as the Royal procession of wickets started. Skipper Pasindu Sooriyabandara was caught short of his crease as the boys from Reid Avenue were in deep trouble at 27 for 4 in the 12th over. The hero from the ‘Big Match’, Royal vice-captain Kavindu Madarasinghe tried to resurrect the chase scoring 23 off 27 balls before he chipped straight to Dellon Peiris to become Munasinghe’s third victim. Thevindu Senarathne was another ‘run-out’ victim as Royal lost the plot against some tidy bowling and neat fielding. Munasinghe completed his five-wicket haul dismissing Kavindu Pathirathne and Lahiru Madusanka in the 10th over of his spell to end on 5 for 32. Out of all the 19 dismissals, 7 were run-outs and the game was also ended in the 35th over in the Royal innings by a run-out. Warden of S. Thomas’ College, Rev. Marc Billimoria declared a holiday on Monday for the students.